Bertil Hörberg has been a dedicated indie developer since mid 2011, and previously developed a game titled "Helium Boy" for iOS & Android platforms. Prior to that, Bertil worked as a gameplay programmer on various games, including the 2009 hit title "Bionic Commando". Bertil Hörberg's most recent shining achievement is "Gunman Clive," a run & gun platformer with a unique western style. Which has already seen substantial success on PC, iOS and Android platforms. Although, the jump over to the 3DS eShop may just be "Gunman Clive's" most successful move yet. The addition of stereoscopic 3D effects, circle pad and button controls definitely make this the definitive version to own, in my opinion. "Gunman Clive" is a simple and very enjoyable run & gun platforming affair containing all of the usual bells and whistles. The storyline is as is for most platformers, very bare bones. The plot behind this story being your typical damsel in distress. From the beginning of the game, you'll have access to play as either Clive or Ms. Johnson. With a third unlockable character becoming available after your first completion of the game. Both Clive & Ms. Johnson possess their own different advantage's and disadvantage's to certain aspects of gameplay. Clive can move considerably quicker, while Ms. Johnson can float across screen something like Princess Peach in "Super Mario Bros. 2" (USA). It's easy to notice just how many gameplay mechanics "Gunman Clive" has borrowed from late & great platformers of the past. During your mission to save Ms. Johnson/Clive, you'll encounter disappearing & reappearing platforms, bad guys w/guns, wolfs, rabbits and even pelicans that'll try to set Clive off his course. Not to mention the many other obstacles you'll be facing off against. The most treacherous of which is the boss battles. The bosses are all pretty generic in form but still supply enough challenge and enjoyment to justify their existence in the game. Twenty short but very sweet stages are all that stands between you and certain victory. 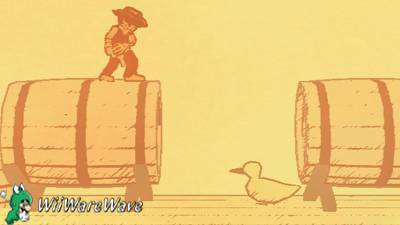 Even though "Gunman Clive" is over quicker than the fast-draw of a gun, there are three levels of difficulty on offer here and an unlockable "Duck Mode" as well. Any of which may require anywhere between 30 mins. and an hour or slightly more of your time. 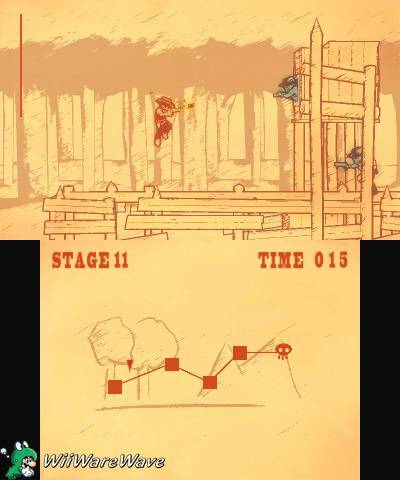 It may have little to no color, but "Gunman Clive's" unique flip-book animation visual style is what really sets it apart from other platformers currently available on the 3DS eShop, and it's extremely charming in a very simplistic manner. The stereoscopic 3D effects are surprisingly crisp & clear, rivaling those displayed in "Mutant Mudds". 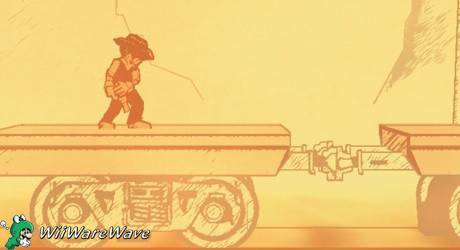 The music in "Gunman Clive" is very upbeat and atmospheric. It's also very appropiate for the old-western setting. 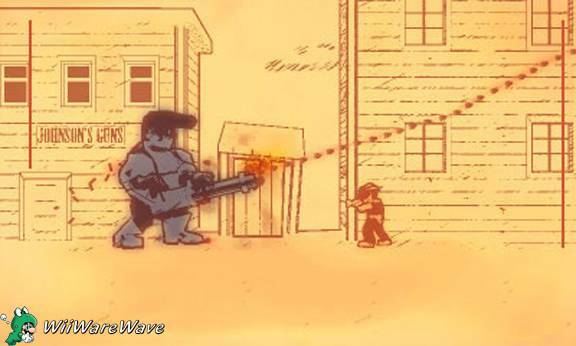 The music and sound effects would've probably been "Gunman Clive's" very best asset, if the game didn't already have so much else going for it. Nonetheless, I found the music was very catchy, and I caught myself multiple times humming along to the beat. As is always, you're more than welcome to post your opinion's in the comment section below. Whoa your review is awesome my friend. Thank you, Rukiafan! That means a lot coming from you my friend, and I'm so glad you enjoyed the read. This being the very first gaming review I've ever produced, I didn't know how it would be received. I actually just typed everything down as it came across my mind. The background info was supplied to me directly from, Bertil Hörberg, the developer. Who was also generous enough to provide me with a reviewer's redemption code for, "Gunman Clive". Which I believe was a very nice gesture. I just hope he's also pleased with my review, because I provided him with a link to WiiWareWave. If we're lucky he may comment or even interact with our community. Edit: I have to give credit, where credit is due. KingreX32 deserves recognition for adding the screenshots and for formatting my review. Good job done KingreX32. That's what separates the amateurs like me from the pros like yourself. Solid review. Sounds like we enjoyed many of the same aspects (especially the stereoscopic effect). I made the same comparison to Princess Peach's floating mechanic when I played as Ms. Johnson as well. Here's hoping Clive sells well on 3DS because he certainly deserves it based on the content and pricing. If you don't mind the obligatory grammar criticism, I noticed your use of commas when referring to the game name was sometimes off. In the third sentence of the third paragraph, you don't need the commas preceding and following "Gunman Clive". There are a couple sentence fragments as well. It's hard to complain too much though, as your first effort is much better than mine was. I'll be looking forward to your next review, naturally. Oh, the quotation marks are fine. Just as you say, it's standard to bold, italicize, or add quotes to relevant titles depending mostly on a publication's writing style. The commas are what I was referring to. See the way "Gunman Clive" often has , before it and , just before the closing quote. Yeah. It is sometimes possible to use commas that way if the sentence grammatically permits the pause, though. Sorry to derail this with grammar nitpicking. Marth, how does it look now my friend. I think I cleaned it up fairly nicely. The artstyle is really interesting in this game it looks like some comic that was written in a news paper during the wild west days. Rukiafan, you don't know the half my friend. You really need to see the game in full stereoscopic 3D motion, to be able and truly understand just how unique Gunman Clive's visual style is. When you're able to do so, I would then recommend that you download this game Rukiafan. It'll probably be the best $2 you've spent in the 3DS eShop, so far. I'll contact Bertil Hörberg and ask him politely for another redemption code, since I obviously can't gift you the game on my 3DS. I think that's fair payment for bringing additional awareness to his game, don't you think? I didn't post that lol. I just have one question, shouldn't this review be located in the "3DS (eShop) Review" section instead of "Nintendo's Latest News"? All reviews start in the news section, so they appear in our portal news and are later moved. It makes the reviews easier to find for guests. Has anyone else other than Marth and myself actually downloaded Gunman Clive yet? It would truly be a shame, if nobody else decided to support this game. Very good review William! I downloaded this game day one just from seeing the trailer. I could tell this was high quality and for only 2$ how can you complain. Great animation and gam play. Reminds me of Mega Man more then anything. It gets quite challenging mid way through and the bosses so far just look wonderful. Best 2$ I've ever spent! You can make one of the most expensive games in the world with highly detailed gameplay mechanics, characters and an overall product thriving with inspiration. However, nothing will come together and shine if the soundtrack isn't up to the same standards. The soundtrack makes up the bare bones of a game regardless of whether it is a high-end triple A product or a simple handheld application. When you don't get that fulfilling and soothing soundtrack, the game feels lackluster. I am super glad to hear Gunman Clive delivers on this note to a point where you started humming to bits of the soundtrack. The art style is definitely interesting and Bertil has done a magnificent job in blending this with everything else. The option to play with two + one unlockable character, an additional game mode and boss encounters are all elements which will inevitably extend the replay value of the product despite the somewhat disappointing 20 missions available. I'm glad they looked at possible alternatives on extending the playtime of the product. Glad to know gameplay wise everything lives up to standards and even on par with other 3DS gems such as Mutant Mudds. Thanks guys, I really appreciate your compliments. I'll be attending my first day of work today in a very longtime. Hopefully, the rest of the day will be as good as waking up to reading your comment's. Tech101, same here my friend, the best $2 I've ever spent on a downloadable game from either the WiiShop or 3DS eShop. I never even knew about the speed badges, before I produced this review for Gunman Clive. Which add tremendously to the replay value, so I may edit my review soon to reflect this new found information. OH wow some how I missed this review. I picked this game up the other night and I have to agree with everyone is saying about this game. Best two dollars I spent in a long time. The graphics and music work well with what this game is about and the game play is great as well. I complete the first play through with Clive and now I am working on Mrs. Johnson. I read somewhere the the 3DS version is out selling both the iOS and droid version so here's to hoping that Bertil will make more eShop games, heck maybe with the success hes having on the 3DS eShop maybe he will make something for the Wii U eShop as well. It's outsell ios but not android just yet. It still has a long ways to go there. I believe I heard he wants to make another game this time designed around the 3ds. Something to do with having buttons to start with. I like the art style this game posesses. Rukiafan wrote: Welcome back tech101. Why thank you! I didn't know anyone missed me. @Tasuki wrote: OH wow some how I missed this review. I picked this game up the other night and I have to agree with everyone is saying about this game. Best two dollars I spent in a long time. The graphics and music work well with what this game is about and the game play is great as well. I complete the first play through with Clive and now I am working on Mrs. Johnson. Never mind you were right. It has outsold android as well. That's saying a lot! Maybe the cost of games will come down a bit because of this. Who knows. At the very least some more frequency of sales. Thank you, Megatron2000! I really wasn't expecting to receive such nice compliments for my very first gaming review. Hopefully, I'll produce another one soon. The only thing is I'm working now, so I don't have nearly as much freetime anymore. this was an awesome review. Well guys, a Gunman Clive review just moseyed into town at IGN. I read through it, and well, see if you don't notice any similarities to my review. Just made a very small change to my review. I also just noticed how you added a link to the official website, and a gameplay trailer KingreX32. Thanks! Very nice, your review is so professional! ^ Thank you very much! I'm glad you think so. What will you review next? You should write more reviews and be revered as the fine champion of the community you are! @LordHoppingRage wrote: You should write more reviews and be revered as the fine champion of the community you are! I really wish I could one day return to writing gaming reviews for WiiWareWave, @LordHoppingRage.